It’s already December 3rd, but don’t think I’ve forgotten about my ‘Style Crushes’ post for the month just gone. I’ve kept this up for 7 months in a row now, can you believe it? I actually can, because it is so easy to find amazing content for these posts thanks to the plethora of incredible bloggers that I follow loyally or discover anew as the months go by. See all my Style Crushes posts here! Take a look at my December faves below, and let me know with a comment if you’ve discovered any bloggers this November that you think I should know about. You’re almost certainly already aware of Olivia, her blog is one of my favourites. Everything is so damn aesthetically pleasing! I especially loved this post which featured three super charming sets of colour co-ordinated photos, my personal favourite being this dreamy baby blue look against the backdrop of a pretty vintage car. 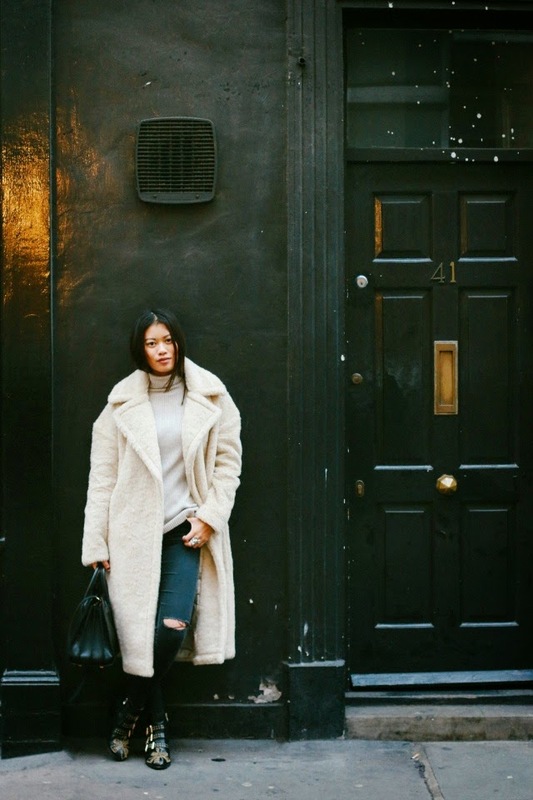 I just NEED this coat in my life after seeing it all over Yanin aka prettysickly’s Instagram, and in this gorgeous winter-casual outfit on her blog too. Who feels my pain? Victoria’s blog gets better and better each time I look at it, and as the photos in this post were taken by yours truly I couldn’t help but feature it! I really love the oversized colour-block scarf she’s wearing, especially paired with those knee high boots. Hannah’s back in my style crushes this month, I couldn’t resist that giant faux fur co-ordinated with burgundy Supergas. Fab! Last but not least is Courtney aka prettylittlefawn. I love Courtney’s cute but also cool laid back LA style, and I love (but also sorta hate) following her Instagram (@prettylittlefawn) which reminds me on a daily basis that I don’t live on the West Coast of the US. Major fashion envy right now. I love Victoria's scarf, so gorgeous and perfect for this cold winter! I love Olivia – her photos are so perfect in every post! What Olivia Did & In The Frow – definitely 2 of my faves! Thanks for the shout-out, lovely! I love following you as well! Yanin and Olivia — crush!